The big game is just won, one of the star players is asked 'What are you going to do now?" "I'm going to Disneyland!" There truly is something magical about a Disneyland vacation, and wether traveling from far from home or a local stay-cation, and you definitely want a nice place to stay. 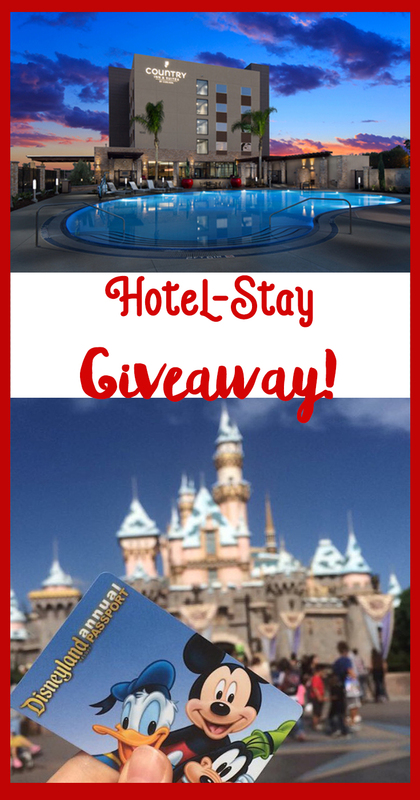 The Country Inn and Suites by Carlson has a brand new hotel, minutes from the Disneyland Resort-- and keep reading- as I will be giving away a one night stay to this brand new hotel! Growing up in the Midwest, I don't think I ever pictured myself living in Southern California after living here for almost ten years I have learned a few things. First, there is a ton of awesome things to do but there will ALWAYS be traffic. Something that should take minutes can sometimes take hours. My daughter has an upcoming soccer tournament near San Diego, and rather than risk getting stuck in bad traffic we are heading down the night before and staying in a hotel. This is why the new Country Inn and Suites by Carlson, Anaheim is perfect! Staying here will ensure you don't have to fight the crazy traffic and can get to Disneyland right when it opens. Then when you are tired and worn out, you can come enjoy a great night's sleep in the 174-room newly constructed hotel with modern interiors and stylish furnishings. The large outdoor patios with pool and whirlpool are a pretty great benefit too, along with a great view of Disneyland's fireworks. Plus did I mention Free Wi-Fi and a Complimentary Hot Breakfast (real breakfast food, not just a bowl of cold cereal or toast!). So, whether you are a local wanting to avoid the crazy traffic, or coming from out of town, definitely check out the brand new Country Inn and Suites by Carlson for your Disneyland vacation stay. 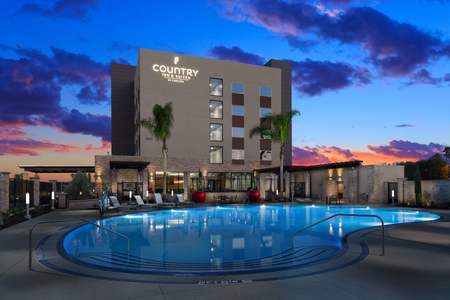 I get to offer one of you my readers, a voucher for a FREE one-night stay at the new Country Inn and Suites by Carlson in Anaheim. Leave a separate comment for each channel that you follow me on along with your name on that account so I can verify. --The Giveaway will run through January 31st, winner will be chosen randomly from valid comments after this time. Winner will be contacted via e-mail and mailed the voucher. There are no substitutions or cash value for prize. Yes! Would be so nice to just sit out and enjoy the weather! I follow on Pinterest as Mom2b2g ....we have never been to Disney....it would be awesome!! I follow you on Fb, instagram! I like being able to see fireworks from the balcony. You can sit and enjoy. The website will redirect you other hotels(of theirs) if dates you picked are not available--I played around. Oh that is a nice feature! I love that the hotel is within walking distance to Disneyland. Yes, that is a huge plus! Oh my goodness .. the fireplace and the pool draw me right in .. both are my favorite about hotels/vacations! Of course I follow you on instagram (me.amandie)! And Pinterest! I love your pins! I love how close this hotel is to the parks and that they offer a free breakfast. I like how they offer a free breakfast! Obviously the proximity to Disneyland is awesome! And who doesn't love free breakfast?! Love that the hotel is within walking distance from Disneyland and that it offers complimentary breakfast. Both of these are so important when traveling to Disneyland. Love how close it is to Disneyland. I love the pool and whirlpool at the hotel! The heated pool would work great for us. It would give the kids a chance to blow off some energy and hubby and I could enjoy with them! I like the free breakfast and hot tub. What's not to love about this hotel! Hot breakfast...yum! Walking distance to the park is great cause it's less travel time! Fireworks and outdoor pool is like icing on the cake! Can't wait to go this summer! Love the free wifi, free breakfast and the short walk to Disneyland. Love the FREE hot breakfast and the fireworks viewing from the pool. Looks like an amazing property. I love how close it is to Disney!